If you are interested in receiving one of these 3 months memberships, please comment below by the end of Sunday. I'll announce the winners, chosen by random.org, on Monday morning. Happy Mother's Day! WOW! Look at those beautiful flowers! Pretty enough to pick and I sure hope you pick me!!!!! Would LOVE to become a Circle member! I would love to become a Circle member... Thank you for the oppurtunity. Those are awesome flowers! I have considered joining for some time, but wondered if it is worth it, so this would be a great opportunity for me to "test drive" it! Hope I'm not too late. That is a sweet gift and the flowers are very cute too, maybe you can make a tutorial. Wow how nice! The flowers are so pretty. I have thought about the Circle, but just was not able to afford it right now, su this prize would be welcomed for sure!! How exciting to get a package from PC when you didn't even place an order!!! The flowers are so pretty. I wonder who made them? Enjoy your flowers, and count me in for a chance to win. Such a great giveaway!!! Thanks for the chance to win! Katie what a truly generous gift from provcraft thanks so much for a chance to win this. wow katie! how fun is that to get something unexpectantly! I love being part of the circle too! I would love to be a part of the Cricut Circle. Thank you for the chance Katie.. I'm new to the Cricut Expression, I love your Everyday pop-up cards videos, please make more! Thanks for the chance to win this. Congratulations to you on your recognition. Wow - would love to be a member in the Cricut Circle. Thanks for a chance to win. What a great Mother's day present. Thanks for the chance to win. These are so pretty and what a great gift to give away. Thanks for the chance to win. It sounds wonderful. Wow what a lovely surprise, thanks for the chance to win one. This would be an awesome Mothers Day gift!! Thanks for the chance!! Congrats on a wonderful gift from PC. They are a great company and this is one of the great benefits to being a "part" of them. Have a great Mother's Day! What a great Mother's day surprise it would be! WOW! What a wonderful gift. I would love love love to win. Thank you so much. Happy Mother's Day! Congratulations. What a great Mother's Day Gift. Would definitely love this giveaway. Thanks for the opportunity to win Katie. So glad you have received such recognition from Provo Craft! You are so fantastically talented and so generous for sharing that with all of us! Oh what an awesome surprise! I can not tell you how badly I would love to receive one! I have wanted to get into the circle for so long but simply can not afford it on my student budget! I would be forever grateful if I am picked! They are beautiful. I saw that Kristal got some too and her were different. What a great idea. those are pretty flowers and I would love to "test drive" the circle membership to see what it's all about!! How exciting to get those beautifully crafted flowers delivered to you! I would LOVE to be a circle member but cannot due to money. congratulations!!!!! Thanks for a chance! I would love to join but just cant at the moment! What a fun thing to get in the mail!I would love a chance to win a 3 month membership. I have always wondered what it is like. Would love to try it out. Thanks for the chance to win. amywooten2010 at gmail dot com. Wow! These are gorgeous. Thanks for the chance to win. Happy mother's day! Wow those are beautiful flowers. I would love to win a 3 month membership.Thanks for the chance. Love the flowers! What a neat gift. Have a Happy Mothers Day. Beautiful flowers! Thank you so much for the chance to win! Congratulations. Beautiful flowers....the circle rocks! The flowers are beautiful! I would love to win a cricut circle membership! Thanks for the opportunity. What a lucky lady. Thank you for the chance to win a subscription. I've been wanting to give the circle a try but due to financial situation I couldn't join. Happy Mother's Day to you. I would love a membership! It would be so great to have the information! Those are gorgeous flowers!! What a great gift! Would love to have 3 months free! The flowers are so cute! I would love to win a membership to the Cricut Circle! I am so glad you were/are recognized for the awesome crafter that you are. I am glad I found your website. I love to "visit" with you everyday. I would love to take Cricut Circle for a test drive because I am not sure if it is worth the money at all. Happy Mother's Day. Thanks for the chance to win this. Gorgeous flowers! What a sweet giveaway! I've been a follower of yours for awhile. I find your projects very inspirational. The flowers are beautiful. I would love to become a circle member, I've been wanting to join but just haven't had the extra money to give it a try. Thank you sooo much for sharing and the opportunity to win one. I would love a chance to win! Thank you! Love your blog! Katie, What a wonderful surprise to receive out of the blue!! And thank you for posting over on the cricut board. I am enjoying your blog and will sub for sure!! It would be great if I WON! those flowers are BEAUtiful! Thanks... and Happy Mother's Day to you.. The flowers are so pretty. Thanks for the chance to win. Thanks for sharing your beautiful gift from PC! Happy Mother's Day. By the way you share your name with my DD (she spells it Katy). Thanks! I'd love to win to see what the Cricut Circle is all about. I would probably love it and then join it. Thanks for the chance to win a 3 month membership. Have been curious about The Circle for a while. Happy Mommy's Day! Lucky you!! :) I would love to me a Cirlce member, too! This would be such an amazing prize. I have only been in the paper crafting world for less than a year and had never even heard of the Cricut Circle until this last CHA. How cool of PC to let you offer these memberships. OMG!!! What a great surprise!! you so deserves it, love your blog and your creativity is awesome!! Love the way you share with others, that's soooo cool!! Thanks for the opp to win, I've been asking myself about the circle, this will be a great way to try it! Have a bless Mother's Day! OMG...I would love to have one of these!!! I have been trying to figure out how to become a Cricut Circle member!!! You are sooo lucky to have received this wonderful gift!! Thank you for making someone else just as lucky. What a sweet gift from PC!! I would love to try out the Circle, but I just can't afford it right now. Thanks for the chance to win a 3 month membership!! Wow... How nice of PC to send you these!! I would love to win a tryout for the circle, always wanted to join but just not in the budget right now!! Thanks for the chance!! Wow Katie congrats to you!!! That is so nice of PC to recognize their special ladies. The flowers are beautiful. Keep your beautiful talent coming to us. wow, i would love to win, i love my cricut. I love the flowers. I'd also love to win a Cricut Circle membership. Love love the bouquet. I'd also love love to win a Cricut Circle Membership. 3 months would be OK maybe then I could purchase the rest of the membership. I hope I hope I hope. I would love to win. Those are very pretty flowers. The flowers are beautiful! I wonder if you could cut these from very thin craft foam (assuming that you can get it off of the mat without tearing it). That opens up a whole new range of products to use with my Cricut. And speaking of Cricut, what a lovely surprise - free Circle memberships! I'd love to have one, but I'm sure that there are many more deserving people on this list (and I'm pretty new to Cricuts anyway), so I will enjoy the success of the winners, no matter who they may be! OMG I would love to win a cricut circle membership love the flowers really cute.Thanks for the opportunity. What beautiful flowers! Thanks for the chance to become a circle member. Wow! What a fabulous giveaway! I wanted to join the Circle when it started, but like so many things, just not in the budget! Keeping my fingers crossed! Beautiful Flowers. And yes, I'd love to be Circle Member!! Thanks for the chance to win. What a cute idea for a mothers day bouquet. I would love the opportunity to be a Circle Member. Thanks for the opportunity. Love your blog, Katie!! I would be totally beside myself to be chosen for the Free Subscription to the Cricut Circle. I came into the action after it started and didn't get the opportunity in the beginning. Thanks for the chance to win!!! I have always wanted to try the Cricut Circle, but it has been to expensive for not knowing what you really get. This would be a great way to try it on a trial basis. Would love to win one of these cute bouquets. Thanks for the chance to win! Those flowers are beautiful. beautiful flowers and thanks for a chame to win. That was such a nice surprise for you. And what a wonderful opportunity for us. I would love to win. Thanks for the opportunity. That is so sweet!! love the flowers!! Would love to win! Thanks! OMG! That would make my day. Love the flowers hope you pick me. I would love to win the 3month subscription to the cricut circle!!!! a 3 month subscription to the cricut circle?what a great treat that would be! thanks for a chance to win! Such beautiful flowers and a beautiful gift to go with them. Thanks for such a great opportunity! Holy Cow! Would I love to win just to try the Cricut Circle. I've been totally curious since I first heard of it. I would love to get a free 3 month trial to the cricut circle. What a great surprise! I love the flowers and the opportunity too! What beautiful flowers! And such a great surprise for you! Thanks for the chance to win a circle membership! Would love to try it out! Thanks for the chance to win! I love the bouquet! Magnificent flowers! What a wonderful surprise for you. I would love a chance to try the Cricut Circle. Thanks for the opportunity! That is so kind of you. I would love to get the 3 months membership. pls enter me. Love your blog! What a neat giveaway! Those flowers are so cute!! What a great gift from PC! Would love to be a member of the Circle. what a awesome gift. id love one. happy mothers day. What a wonderful Mother's Day present winning one of those 3 month subscriptions would be! I have been dreaming of joining the Cricut Circle since I heard about it last year! Not only would I love to be inspired by the additional message boards, but I would love, love, love to finally be able to spend my Cricut rewards (I heard the selection the Circle members have is phenomenal!)!!!!!!!! What a lovely bouquet this is for mother's day! I would love to be in the circle. I have not joined yet because I can not see that the price is worth it, but possible if I get a taste of it so to speak, I will be hooked. Thanks for the chance to win this 'taste'. What an awesome opportunity! I sure hope I win :) Good Luck everyone! This is such a cool opportunity to become a part of the circle!!! I would love to be a part of the circle! WOW...with summer coming that means I will be able to spend some quality time with 2 8 year old granddaughters crafting. I could use some fun ideas and this looks like the place. Thanks for a chance to win. Gorgeous flowers!!! What an amazing gift for Mothers' Day! Thanks for the chance! What a besutiful bouquet! I'd love to try out the Circle! I've heard so much about it, but just don't have the funds right now. Enjoy your flowers and Happy Mother's Day! Thanks for sharing! What a nice surprise!!! i would love to win this ! Would love to have a chance to try it out:-) thanks for the opportunity! What an amazing gift! I love the circle and would love the chance for 3 months for free. What a great giveaway I would love to win this. It would be great to get the 3 months!! Great gift. I would love to be in the circle and know how to make those flowers! I would LOVE to get a circle membership! I was so tempted when it started. What a wonderful gift. I also would love to be a circle member. I love the gift box. I will have to try out the cart. Thanks for the chance to win. What a wonderful Mother's day gift! Those flowers are amazing!!! I would be over the moon to win this giveaway, I couldn't afford it otherwise. Thank you so much for sharing with us. I would love to win this. Thanks so much for the opportunity!! Pretty flowers! Thanks for a chance to win, I'd love the chance to try out the Circle. Great give away, would love to win, and those flowers are sooo pretty! Wow, I've always been curious about the Cricut Circle Club - would love to win a 3 month membership. Thanks for this opportunity!--Pat N.
I can't tell you enough how happy I would be to win this! I have wanted to join ever since Cricut Circle began but just can't afford (dang economy! lol). This would really make my week (both my birthday and Mother's Day all in one week). Thanks for the opportunity! What a nice surprise, and very kind of you to pass your gifts around. Thanks for the chance to get into the circle- good luck crafty peeps!! Oh my I would absolutely love to win this; and the flowers look so real love them! What a pretty Mother's Day bouquet!!! Would love the chance to try out the Cricut Circle!! Thanks for the chance to win! The flowers are beautiful and the give away is great. Would love a chance to win the free three months to the Circle. I love it in the Circle! What pretty flowers!! What a great gift from PC. Thanks for the chance to win. This would be such a great Mothers Day gift for my wife!! Thanks for the chance to win. Your flowers are so georgous! I'm not a Circle member but would love to give it a try. Thanks so much for a chance to win. I think it would be awesome to get a chance to try out the cricut circle. I've thought about it a lot but just wasn't sure if its worth it. But I love my cricut and my gypsy dearly! Lol would be a great blessing to get this opportunity. 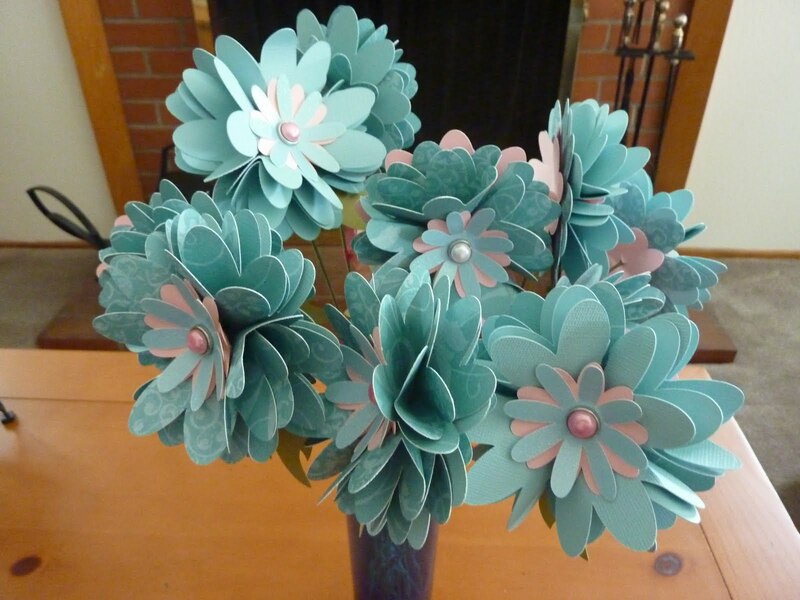 Love the paper flowers! What a special gift! 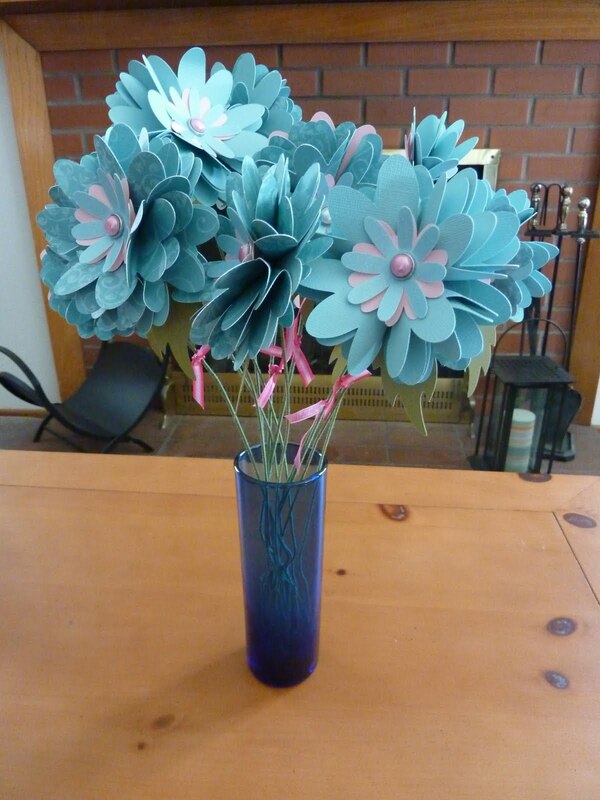 I'm lovin your "flowers" and I'm lovin a chance to win the Cricut Circle 3 mo subscription. I'm also lovin your blog. I just love the flowers. I do not know anything about the circle club. I would love to give it a try and get to know all of the fun and projects. Wow! What a great give away. Thanks for the chance to win. The flowers are beautiful. Gorgeous flowers that you received. The Cricuit Circle looks like a wonderful place to learn, share and meet others. Thanks for the opportunity to enter. I would be so awesome towin a membership. I really, really want to be a part of the Circle! Pick me! Pick me! HAPPY MOTHERS DAY TO YOU, HAVE A WONDERFUL DAY WITH FAMILY. Wow, that would be awesome to be in the circle! Have a great day! I hope Im not too late to enter! Anyways I would love to win a subscription to the circle. I have wanted to join for such a long time but I just can not spend that much money as I do not have it because I am a student and am barely working part time hours - so it is hard to justify spending the money! I get all my inspiration online on the cricut board and through blogs as none of my friends are interested in papercrafting - though they do enjoy everything I create. I just know I would receive so much more inspiration from the circle. Thank you for the chance to win! Good luck to everyone and Happy Mothers Day!